‘NHS staff will get the backing they need’ is just one of the many ambitions the Long Term Plan sets out. At a national level, health care providers are feeling the strain of increased staffing vacancies, with the biggest shortfall in nursing. A recent report from the Nuffield Trust, Health Foundation and King’s Fund, claims that NHS England has limited opportunity to train enough GPs and nurses to solve the shortages it faces. So what can we do as a responsible Trust to drive down our vacancy rate and make sure our staff are satisfied in their current roles? Thanks to the hard work and dedication of our staffing team, we are in a really positive position with a current band 5 nurse vacancy rate of 1.48%. This has been achieved through an innovative approach to recruitment, breaking away from traditions and creating a solution that meets the needs of the organisation and new recruits alike. These recruitment centres are a unique set up, encouraging hands on participation with a practical approach to identifying our future workforce. Instead of applying for one specific area, prospective nurses are encouraged to spend time across the Trust before deciding their future. On a recent ward round, I spoke with a Registered Nurse who had joined the Trust six months ago via our new process. 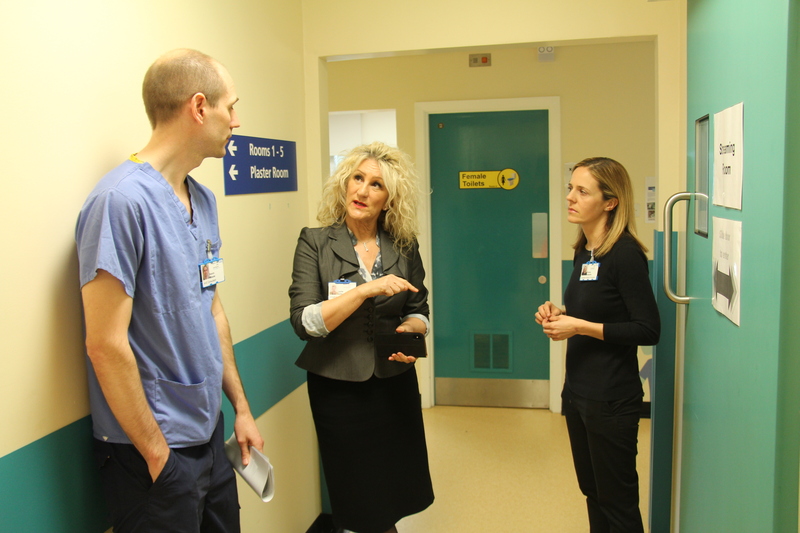 With her ambitions set on Theatres, she was encouraged to experience some time on the Emergency Assessment Unit before making a commitment. She excitedly told me that after seeing first-hand the fast paced environment of EAU, she can’t see herself working anywhere else. This is why we are considered thought leaders – providing new recruits with a unique insight into the world of healthcare and giving them a platform to choose their own path into an area they are truly passionate about. Just last week BBC Radio Tees visited the Trust to speak with Dr Catherine Monaghan who was recently awarded ‘Top Inspiring Physician’ across the whole country from the Royal College of Physicians of Edinburgh. The interview was fantastic, not only exploring Dr Monaghan’s personal journey, but how the Trust’s ability to empower its leaders has facilitated some of her greatest successes. Professor Jane Metcalf spoke too about the challenges facing recruitment, not only that of women getting into medicine, but people from across the region in general. I believe there is a great deal of work we can do to support our future generations, opening up pathways to encourage them into the world of medicine. There is a belief that those who live locally who might go away to train, will gravitate back to their home patch and we have a corporate social responsibility to help this happen. Providing a positive, supportive and inclusive culture for staff is key to developing and retaining a skilled workforce who can care for their patients. Our most recent independent ‘well-led’ report specifically identified the positive culture within our Trust, a quality that sets us apart from other organisations. This is testament to the hard work of staff who, in the face of huge pressures, continue to treat colleagues with respect whilst putting patients first. The ability to care for our communities is reliant upon us caring for our staff first. We have an award winning health and wellbeing programme and in the recent national Staff Survey, the Trust scored the highest nationally for taking positive action on Health and Wellbeing. In support of this, we have established an open and transparent culture – nationally, we had the highest number of staff say they were confident their concerns would be addressed by the organisation. There is still progress to be made, and as we continue to assume ownership for a more aspirant and healthy future for our communities, recruitment must remain a priority to build a resilient and inspiring workforce.